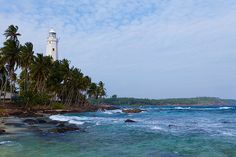 Lighthouse at Devi Nuwara Lighthouse at Devi Nuwara, just a kilometer south of Dondra town, a British built octagonal lighthouse (1889) marks the southernmost point in Sri Lanka. Standing 54 meters tall, the light house presents sweeping views of up & down the coast. To the south from this tropical coast here, beyond the view of local fishing boats riding the indigo waves there is nothing until Antarctica.